If you are buying a home with a septic tank, we recommend having it inspected by a professional septic contractor. In Florida, the law only allows a licensed septic system designer or installer to perform a septic system inspection. Therefore, our standard home inspection does not include this type of specialized, intrusive inspection. To properly inspect the system, the contractor will need to dig holes to access the underground parts of the system. This will include inspecting the tank, as well as the leach field. Septic systems are individual wastewater treatment systems that use the soil to treat small wastewater flows, usually from individual homes. They are typically used in rural or large lot settings where centralized wastewater treatment is impractical. There are many types of septic systems in use today. While all septic systems are individually designed for each site, most septic systems are based on the same principles. 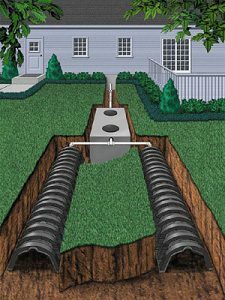 A septic system consists of a septic tank, a distribution box and a drainfield, all connected by pipes, called conveyance lines. Your septic system treats your household wastewater by temporarily holding it in the septic tank where heavy solids and lighter scum are allowed to separate from the wastewater. This separation process is known as primary treatment. The solids stored in the tank are decomposed by bacteria and later removed, along with the lighter scum, by a professional septic tank pumper. After the partially treated wastewater leaves the tank, it flows into a distribution box, which separates this flow evenly into a network of drainfield trenches. Drainage holes at the bottom of each line allow the wastewater to drain into gravel trenches for temporary storage. This effluent then slowly seeps into the subsurface soil where it is further treated and purified (secondary treatment). A properly functioning septic system does not pollute the groundwater.